When Maestro Joseph Rescigno became artistic director of Montreal's Orchestre Métropolitain eighteen months ago, one of his ambitions was to conduct Act I of Richard Wagner's opera Die Walküre. On 29 January 1998, Rescigno's dream will come true when he leads a concert performance starring Linda Roark-Strummer as Sieglinde, Jon Fredric West as Siegmund, and Edward Russell as Hunding. Maestro Rescigno spoke to La Scena Musicale about Die Walküre and the Orchestre Métropolitain's future operatic projects. LSM: What attracted you to Die Walküre? JR: As you know, I am the artistic director of the Florentine Opera in Milwaukee, Wisconsin. In 1992, I conducted Die Walküre as part of their 60th anniversary celebrations. The marvellous thing about Wagner's operas is that many single acts can stand on their own as dramas. Die Walküre can be divided into two stories: Act I, and Acts II and III. The form and shape of Act I of Die Walküre is self-contained. Act I of Parsifal and all of Das Rheingold can also be performed in concert, as was done by Solti with the Chicago Symphony at Carnegie Hall. From the audience's viewpoint Die Walküre is a very accessible work because it doesn't require the kind of preparation or knowledge that operas like Elektra need. Like Act II of Tristan und Isolde, Act I of Die Walküre contains some of the most ecstatic love music ever written. In addition, it is relatively economical to present: Act I requires only three singers and sets are not really needed because the drama is psychological. A Sieglinde soprano is easier to find than a Brünnhilde or Elektra. I know of two excellent Siegmunds. Unfortunately the best Wotans cost a lot. We've spent quite a lot on the three soloists even though the Orchestre Métropolitain's subsidies from the Conseil des arts et des lettres have been cut twice. If we can sell most of Salle Wilfrid-Pelletier we'll be comfortable, but if we sell only half the seats we'll be in trouble. I'm hoping that there are enough people in Montreal who want to hear this work, which was last conducted here by Franz-Paul Decker in the 1970s. LSM: How do you approach the conducting of a Wagner work? JR: I conduct Wagner as I would conduct a great symphony, for example Mahler. The music is tough to play for the orchestra but not as tough as Elektra. Before studying Die Walküre, I thought the fugal section after the Ride of the Valkyries (basically Act 3, Scene 2) would be the most difficult. But in practice I found that the really difficult moments are the static areas where you have to maintain the intensity despite slow tempi, for example in the early part of Act 1, after the storm, in the difficult monologue, and in the "Todgeweihten" scene between Brünnhilde and Siegmund in Act 2 Scene 4. In those places the musicians really have to concentrate. There's a lot of hard writing for the Wagner tubas, and there is constant danger of sagging because the tempos are slow. Conducting Wagner is like a math problem, working with the interrelated tempos and values of the score. For instance, when Sieglinde sings her first aria, "Der Männer Sippe", she is telling the story of her wedding and how the sword got in the tree. Midway, there is a place marked sehr lebhaft when the tempos change. Most people don't realize how fast that should be. If we choose the right tempo, then the rest of the act falls into place. Up until that point, the tempos are loosely interrelated but somewhat episodic. From that moment on, there is an absolutely strict relationship. If it is taken at the right tempo ‹ I take it at double the previous tempo ‹ then when you have Siegmund's next entry and the end of his little section after that, then one pulse of the new 9/8 "Wintersturme" tempo, i.e. one dotted quarter, would be equal to half of the previous measure. Unfortunately what you often hear today are accelerandi and ritardandi at the seams where two sections join. In my opinion that is almost the worst place to do it. When tempos wander from section to section, it gets boring. In Wagner most of the changes happen in the middle between section joints because the overall form is so long. To know where these occur requires immense foresight. Wagner usually has only one or two climaxes per act. Most conductors get carried away, which is why it is important to scale these very carefully. LSM: Where is the climax of Act I? There is a secondary climax when Siegmund calls out for his father, "Father, Father ‹ where is my sword?" The second "Father" has to be longer than the first. That is a big moment, an absolute primeval cry of this man for his father. The primary climax is when Siegmund pulls the sword out of the tree ‹ pianissimo! For me, the emotional climax of the entire opera is not the loudest point. It is Wotan's farewell towards the very end. JR:I've worked with all three singers before. Linda Roark-Strummer has been singing the Italian repertoire, but I have encouraged her to try the German repertoire - Wagner and Strauss, which suits her voice and temperament. Linda sang her first Ariadne with me in 1990 on a PBS telecast and this will be her first Sieglinde. Tenor Jon Fredric West, our Siegmund, also used to sing mainly Italian repertoire, but his career has really opened since he started to sing German. I hope the soloists will sing without scores. LSM: Which recordings of Die Walküre do you like? 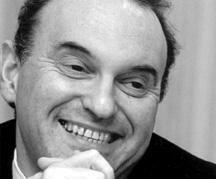 JR: Solti is wonderful. I like Leinsdorf's version with Nilsson as Brünnhilde and Vickers as Siegmund. But I'm not a huge fan of records. I disapprove of using records to learn music. LSM: Will Strummer be doing the shriek when Siegmund pulls the sword out of the tree? JR: I doubt it. The shriek was not Richard Wagner's idea. It was introduced at Bayreuth by his grandson Wieland for Leonie Rysanek, who did it wonderfully. To me the scream should be orgasmic because it is cathartic. Siegmund taking the sword out of the tree has obvious phallic symbolism, but it also symbolizes the concept of a new age. The sword is the weapon of the new man, while the spear is the weapon of primitive man or the old gods, as in the King Arthur legend. LSM: What else is on the concert program? JR: I've decided to make it an all-Wagner concert. We'll open with the overtures to Die Meistersinger and Der fliegende Holländer, then do Die Walküre after the intermission. SM: Any future plans for more opera in concert with the Orchestre Métropolitain? JR: Yes, I'm planning an opera for next season. At this point I can only say it is Wagnerian in style but with family entertainment. I love the German repertoire, but I feel that it has been underserved by both the Opéra de Montréal and the Montreal Symphony Orchestra, perhaps because it is so difficult to play. It could be an interesting niche for the Orchestre Métropolitain to fill. In general, I want to find vocal works that have not been presented much in Montreal. Wagner's Wesendonk Lieder, Strauss lieder, Mahler song cycles, and Brahms' Rinaldo are possibilities. I'm considering the possibility of performing some works by Richard Strauss with the Orchestre Métropolitain. I don't think Elektra, Die Frau ohne Schatten, or Capriccio have been done. The Opéra de Montréal is already planning Strauss' Salome, which leaves us Elektra, which we could do with no staging because it basically requires three people. If there are enough vocal music lovers in Montreal to support us, I'd be happy to produce one opera in concert each year.